The large Bumi is an interactive dog toy that your dog won’t want to put down! Bumi is so much more than a tug toy – pull, flex, throw, float, and repeat! Guaranteed to last, even against those 'destructive dogs'. 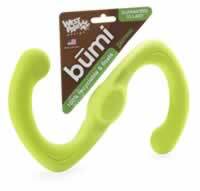 Since Bumi is 100% recyclable, this dog toy will never need to be thrown away (except during a game of fetch! ).